Having found at USPTO a lot of LEGO Patents online, filed by Interlego A.G. (Switzerland) as Assignee, I started to look more in detail at them and found somevery interesting info from which I'll give an example, here below. 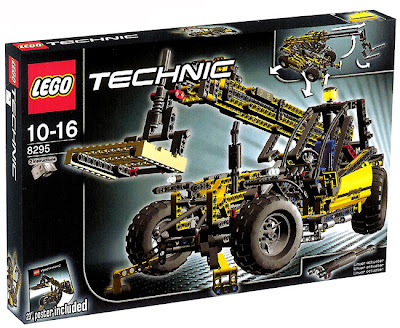 As it as been discussed in several posts here at TBs, there are a few upcoming TECHNIC sets for the 2nd half of 2008 which will bring a new Linear Actuator TECHNIC part. 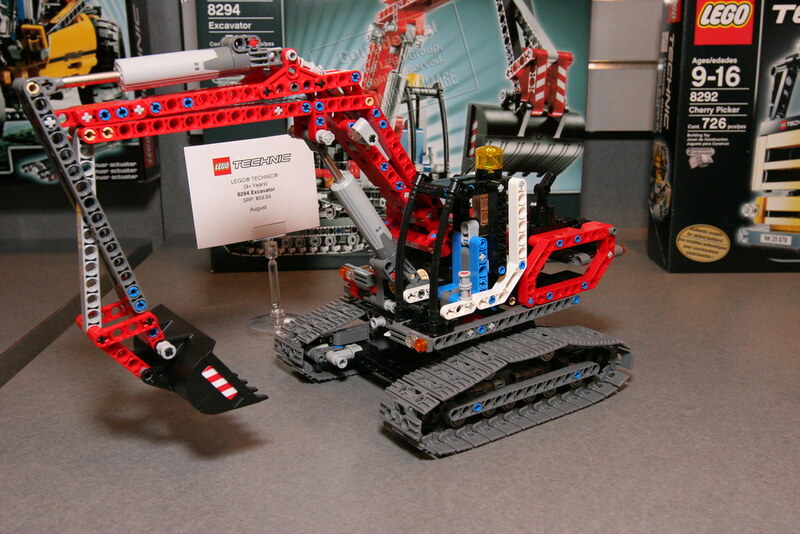 These (shown below) are the Excavator (8294), with two LAs and the Telescopic Handler (8295), with one LA. Imagine which was my surprise when I found an Interlego patent filed back in 1985, about a very similar idea. This patent (4.998.903) describes a 'Toy Actuation System' that mimics hydromechanical actuator components in a toy model. A ram to be more precise. These elements include actuating units comprising each a cylinder casing and a piston rod slidably arranged therein and displaceable by a threaded spindle in engagement with the piston rod. Rotary motion is transmitted to the threaded spindle by a flexible shaft having plug-in connectors at both ends. See more details an images on the excerpts below. So, I do believe this patent concerns with a long dated and original idea, for the actually LEGO TECHNIC LAs, being released. LAs are applied in reality and with LEGO models, where pneumatics are of no use. Pneumatics tend to have a lot of "bounce" in them which makes them extremely unsuitable for heavy or variable load applications where precision is necessary; and speaking of precision, precise control is impossible. Internals and working principles for these parts above, should be very similar to the custom ram like (or LA) that Jennifer Clark developed in its All Terrain Crane (Demag AC50-1). See her photos below. Jennifer used a lead screw (simply a long screw) with a cross axle machined onto the end to allow the connection of standard Lego gears, and this in turn goes into a tubular casing (painted white in the photo) which has a small threaded section at one end and an attachment similar to the LEGO pneumatic cylinders at the other. Depending on the direction it is turned, the lead screw forces the casing upwards or downwards and thus actuates the boom in a manner analogous to the hydraulic on a real crane. Lead screws are not as efficient as hydraulics, but certainly far more practical (and less messy) at used scale! Read more on Jennifer's webpage referred above. Lego pneumatics can be precise under certain circumstances. The cylinder's movement can be very precise when air in pumped evenly and slowly with a motorized pump (or even manually with the mini pump). This is valid for application where the cylinders do extend and contract under the same force demands, as oppose to the case where the cylinder is under a heavy load, for example raising a crane’s arm: When going up the movement can be precise but once the switch change its position the arm will fall down fast and out of control. There are ways to compensate for that but at the expense of more complicated designs. It looks difficult to assemble.